Aug. 8, 2013, 10 a.m.
By Caroline O’Donovan @ceodonovan Aug. 8, 2013, 10 a.m.
David Burnham’s The Rise of the Computer State came out in 1983, a time when, for the most obvious of reasons, making comparisons between George Orwell’s 1984 and real life was coming into vogue. Burnham was an investigative reporter at The New York Times for nearly twenty years, and The Rise of the Computer State was his third book — his first two were about corruption, money, and the government. The book speaks to the history of government data and the combination of fear and anger many Americans feel when confronted with how much our government knows about us. Based on his foreword to the book, excerpted below, one can only imagine how Walter Cronkite would have responded to recent discoveries about how much digital information about us the NSA has. In a New York Times review of the book, John Brooks writes: “The Government’s huge and little-known National Security Agency collects, through electronic espionage, so much raw data that it sometimes needs to destroy tens of thousands of pounds of excess secret paper a day. How much, then, do they keep a day?” He also points to the CIA, FBI, IRS, and private companies including AT&T and “computerized credit companies” as dangers highlighted by Burnham’s book. What’s familiar in The Rise of the Computer State is the tone — one of suspicion, fear, and confusion around the government and what it controls. What’s different, of course, is that technology has advanced by leaps and bounds — maybe even faster than Burnham would have predicted — and our government has more invisible access to a greater volume of information about us than ever before. And yet Orwell, with his vivid imagination, was unable to foresee the actual shape of the threat that would exist in 1984. It turns out to be the ubiquitous computer and its ancillary communications networks. Without the malign intent of any government system or would-be dictator, our privacy is being invaded, and more and more of the experiences which should be solely our own are finding their way into electronic files that the curious can scrutinize at the punch of a button. The airline companies have a computer record of our travels — where we went and how long we stayed and, possibly, with whom we traveled. The car rental firms have a computer record of the days and distances we went afield. Hotel computers can fill in a myriad of detail about our stays away from home, and the credit card computers know a great deal about the meals we ate, and with how many guests. The computer files at the Internal Revenue Service, the Census Bureau, the Social Security Administration, the various security agencies such as the Federal Bureau of Investigation and our own insurance companies know everything here is to know about our economic, social and marital status, even down to our past illnesses and the state of our health. If — or is it when? — these computers are permitted to talk to one another, when they are interlinked, they can spew out a roomful of data on each of us that will leave us naked before whoever gains access to the information. But we must be vigilant against their misuse, either accidentally or intentionally. The alarm is raised here that, while we are only too aware now of the danger of losing everything in a nuclear holocaust, there also is a danger of losing it all in the green glow from a little phosphor screen. POSTED Aug. 8, 2013, 10 a.m.
O'Donovan, Caroline. "Summer Reading 2013: “The Rise of the Computer State” by David Burnham (1983)." Nieman Journalism Lab. Nieman Foundation for Journalism at Harvard, 8 Aug. 2013. Web. 18 Apr. 2019. O'Donovan, Caroline. 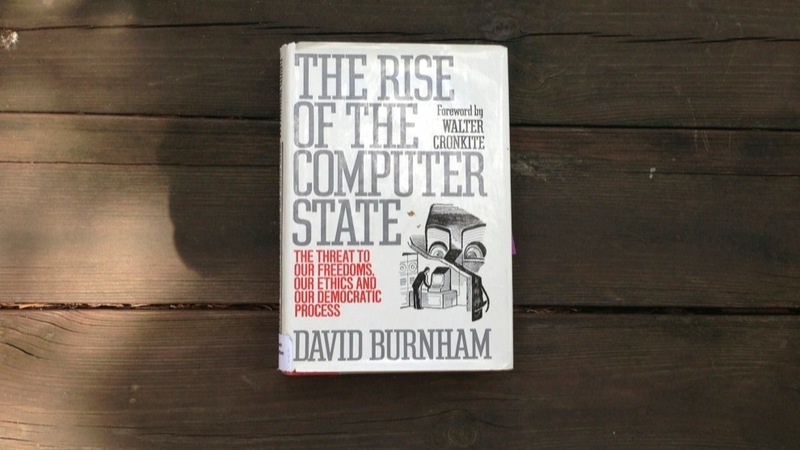 "Summer Reading 2013: “The Rise of the Computer State” by David Burnham (1983)." Nieman Journalism Lab. Last modified August 8, 2013. Accessed April 18, 2019. https://www.niemanlab.org/2013/08/summer-reading-2013-the-rise-of-the-computer-state-the-threat-to-our-freedoms-our-ethics-and-our-democratic-process-by-david-burnham-1983/.